Born 1888 Coventry. Daughter of John Joseph Franklin and Amy Kimberley. Wife of Reginald Silver Magson. Resided 60 Cambridge Street, Coventry. Killed in the October Raids 14/10/1940 Aged 52 at 60 Cambridge Street, Coventry. Buried London Road Cemetery, Coventry. Born 1885 Coventry. Son of Jonathan Magson and Elizabeth Silver. Husband of Ethel Mary Franklin. Resided 60 Cambridge Street, Coventry. Killed in the October Raids 14/10/1940 Aged 55 at 60 Cambridge Street, Coventry. Buried London Road Cemetery, Coventry. Resided at 16 Rodney Place, Nelson Grove Row, Wimbledon. Died as a result of injuries received in the Coventry Blitz at Emergency Hospital Stratford-on-Avon 19/11/1940. Born at Northampton. Resided 23 Court 7 House Spon Street. Employed at Alfred Herbert Limited. Killed in the Coventry Blitz 14/11/1940 Aged 67 at Spon Street. Buried London Road Cemetery Coventry. Born 17/10/1915 at Abbey Donney, County Kerry. Son of George and Bridget Maloney, of Chute Hall, Tralee, County Kerry. Resided at 11 Albert Street. Labourer employed by Building Contractors. Killed in the October Raids 14/10/1940 Aged 24 at 11 Albert Street. Husband of Florence West. Father of Lilian Maud, Doris, Rose and Eileen Mardling. Resided 67 Harper Road. Employed Armstrong Siddeley Motors Limited. Killed in the April Raids 09/04/1941 at 67 Harper Road aged 60. Buried in the Communal Grave, London Road Cemetery, Coventry. Born 1879 Coventry. Resided 50 Hartlepool Road. Husband of Ellen Brown. Employed Rootes Securities Limited. Killed in the October Raids 19/04/1940 aged 62 at 49 Castle Street. Buried in the Communal Grave, London Road Cemetery, Coventry. Wife of Benjamin Mardling. Resided 50 Hartlepool Road. Housewife. Killed in the October Raids 19/04/1940 aged 57 at 49 Castle Street. Buried in the Communal Grave, London Road Cemetery, Coventry. Born 03/06/1886 Walcot, Bath. Wife of Arthur Mardling. Mother of Lilian Maud, Doris, Rose and Eileen Mardling. Resided 67 Harper Road. Housewife. Killed in the April Raids 09/04/1941 aged 57 at 67 Harper Road. Buried in the Communal Grave, London Road Cemetery, Coventry. Resided 111 Broomfield Road. Killed in the Coventry Blitz 14/11/1940 aged 56 at 111 Broomfield Road. Buried in the Communal Grave, London Road Cemetery, Coventry. Born 1925 Hackney, London. Daughter of Herbert Marley and Mrs Marley nee Dance. Killed in the Coventry Blitz 14/11/1940 aged 15 at 111 Broomfield Road. Buried in the Communal Grave, London Road Cemetery, Coventry. Born 1927 Hackney, London. Daughter of Herbert Marley and Mrs Marley nee Dance. Killed in the Coventry Blitz 14/11/1940 aged 13 at 111 Broomfield Road. Buried in the Communal Grave, London Road Cemetery, Coventry. Daughter of Ernest James and Vera Mary Mason Born 07/06/1940 at Coventry. Resided at 62 Stevenson Road. Killed in the April Raids 17/09/1940 at 62 Stevenson Road Aged 3 Months. Buried London Road Cemetery Coventry. Husband of Marion Woodlock. Resided 82 Poole Road, Coventry. Employed Daimler Limited. Works Fire Service. Injured in the April Raids 09/04/1941 at the Daimler Works. Died later the same day Aged 33 at Warwick Hospital. Buried Warwick. Born 17/07/1914 at Coventry. Daughter of Herbert G Warner and Violet M Wright, of 114 Grangemouth Road. Wife of Ernest James Mason. Resided at 62 Stevenson Road. Housewife. Killed in the April Raids 17/09/1940 at 62 Stevenson Road Aged 26. Buried London Road Cemetery Coventry. Born 27/01/1925 at Coventry. Resided 11 Meadow Street, Coventry. Daughter of Private G Mason, Pioneer Corps. Joined Blue Coat Girls School 20/08/1936 aged eleven and a half, boarding and training for service post war together with sister Joyce. Employed as an Usherette at the Empire Cinema. Injured in the Coventry Blitz 14/11/1940 at Hertford Street and died later the same day at Gulson Road Hospital aged 16. Buried in the Communal Grave, London Road Cemetery, Coventry. Born 06/02/1923 at Chilvers Coton. Son of Wallis G Masser and Gertrude M Butler. Resided 97 Coton Road, Nuneaton. Employed Armstong Siddeley Motor Company Limited. Killed in the Coventry Blitz 14/11/1940 Aged 17 at the Armstong Siddeley Works. Buried Chilvers Coton Churchyard. Born 17/11/1914 County Durham. Wife of Reginald E Masters. Daughter of David Walker Harris and Henrietta Purvis of 175 Cross Road. Sister of Dorothy M Harris. Employed Morris Motors Limited. Killed in the Coventry Blitz 14/11/1940 Aged 26 at 41 Clovelly Road. Buried in the Communal Grave at London Road Cemetery, Coventry. Born 03/12/1920 at Coventry. Son of Norman Matthews and Mrs Matthews nee Gibbons. Brother of Sybil Matthews. Resided at 68 Hollis Road. Employed at the British Thomson-Houston Company Limited. Killed in the Coventry Blitz 14/11/1940 Aged 19 at Hollis Road. Buried in the Communal Grave London Road Cemetery. Born 1892 Coventry. Son of the late Arthur Matts a Builders Manager and Mary Ann Cockbill. Husband of Florence Beatrice of Rosslyn House, Stoke Green, Coventry. Resided 9 Stoke Green. Builder and Contractor. Freeman of the City of Coventry, Commandant of the Special Constabulary. Injured in the April Raids 08/04/1941 at Central Police Station, St. Mary's Street whilst on duty. Died 10/04/1941 at Warwick Hospital Aged 48 Buried Stoke Church Yard Coventry. Born 03/07/1912 at Stoke-on-Trent. Son of Mrs Mayer, of 7 Bignall End Road, Bignall End, Stoke-on-Trent, Staffordshire. Husband of Maud Walton. Resided at 18 Hastings Road. Employed by British Thomson-Houston. Killed in the October Raids 21/10/1940 at 18 Hastings Road Aged 27. Buried Stoke Heath Cemetery. Born 04/03/1912 at Stoke-on-Trent. Daughter of Mrs Walton, of 62 Heath Road. Wife of Harold Mayer. Resided at 18 Hastings Road. Housewife. Killed in the October Raids 21/10/1940 at 18 Hastings Road Aged 27. Buried Stoke Heath Cemetery. Born 25/01/1940 at Coventry. Daughter of Harold Mayer and Maud Forester. Resided at 18 Hastings Road. Killed in the October Raids 21/10/1940 at 18 Hastings Road Aged 9 Months. Buried Stoke Heath Cemetery. Born 28/07/1918 Coventry. Son of Alexander (Corporal A Mc Arthur killed in action 20/10/1918) and Florence Jones. Resided at 25 Lanchester Road, Radford. Employed Alfred Herbert Limited. Member of the St John’s Ambulance Brigade. Server of the Alter at St Nicholas Church Radford. Killed in the Coventry Blitz 14/11/1940 at St Nicholas Church Radford Aged 22 together with Bernard Harbourne, Alan Hiscocks and Douglas Hill. Buried Bedworth Church Yard. Mother of Noel. Resided at 3 Henry Street. Killed in the October Raids 13/10/1940 at Henry Street. Aged 27. Buried London Road Cemetery Coventry. Resided at 3 Henry Street. Killed in the October Raids 13/10/1940 at Henry Street Aged 22 Months. Buried London Road Cemetery Coventry. Born 21/12/1889 Limerick. Husband of Dora McInerney, of Nuneaton. Resided 58 Parkside. Pte Royal Warwickshire Regiment enlisted September 1939. Killed in the Coventry Blitz 14/11/1940 at Parkside Aged 50. Buried London Road Cemetery, Coventry. Born 23/10/1901 at Coventry. Daughter of Frederick Henry Williams a Watchcase Joint Finisher and Emily Waring of 30 Newdigate Road. Sister of Alice, Ellen, Maud, Frank, Arthur and Ethel Williams. Wife of Leonard Reginald McKnight. Resided 2 Quilletts Close. Housewife. Killed in the April Raids 09/04/1941 Aged 39 at 2 Quilletts Close. Buried in the Communal Grave, London Road Cemetery, Coventry. Born 1903 at Coventry. Son of William Henry McKnight an Iron Polisher and Ellen Milligan of 100 King Edward Road. Husband of Doris Wiliams. Resided 2 Quilletts Close. Firewatcher. Killed in the April Raids 09/04/1941 Aged 38 at 2 Quilletts Close. Buried in the Communal Grave, London Road Cemetery, Coventry. Born 1936 Lambeth, London. 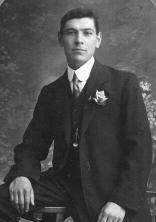 Son of Arthur Oswald McMurdie and Ivy Cordwell. Resided 6 Beanfield Avenue, Green Lane, Coventry. Injured in the Coventry Blitz 14/11/1940 at 28 Beanfield Avenue. Died 27/12/1940 Aged 4 at St Cross Hospital, Rugby. Buried Rugby. Born 16/10/1905 at Coventry. Son of William and Lily May Twaites of 80 Far Gosford Street, Brother of Nellie and George Miles. Husband of May Judge. Employed Armstrong Siddeley Motors Limited. Killed in the Coventry Blitz 14/11/1940 Aged 30 at Armstrong Siddleley Works, Parkside. Buried in the Communal Grave, London Road Cemetery, Coventry. Born 1902 Coventry. Daughter of George William Miles and Clara Pallet. (Sister of Ethel May Walters nee Miles). Resided 40 Godiva Street. Killed in the Coventry Blitz 14/11/1940 Aged 39 at the Motor Hotel, Dorset Road. Buried in the Communal Grave, London Road Cemetery, Coventry. Born 19/04/1923 at Swansea. Daughter of Oscar and Blanche Miller. Resided at 12 Hugh Road. Employed at Walkers in Empress Buildings. Killed in the Coventry Blitz 14/11/1940 Aged 17 at the Gaumont Cinema, Jordon Well, Coventry. Buried London Road Cemetery Coventry. Born 01/04/1935 at Coventry. Daughter of John Edward Moffitt and Gertrude Annie Andrews. Resided 99 Ashington Grove. Attended Willenhall, Church of England School. Killed in the April Raids 08/04/1941 Aged 6 at 99 Ashington Grove. Buried in the Communal Grave at London Road, Cemetery, Coventry. Born 07/08/1901 at Coventry. Daughter of Thomas Charles Andrews and Annie Beasley of 22 Sunningdale Avenue. Sister of Iris W Andrews. Wife of John Edward Moffitt. Resided 99 Ashington Grove. Killed in the April Raids 08/04/1941 Aged 39 at 99 Ashington Grove. Buried in the Communal Grave at London Road, Cemetery, Coventry. Born 24/05/1936 at Coventry. Son of John Edward Moffitt and Gertrude Annie. Resided 99 Ashington Grove. Attended Willenhall, Church of England School. Killed in the April Raids 08/04/1941 Aged 4 at 99 Ashington Grove. Buried in the Communal Grave at London Road, Cemetery, Coventry. Daughter of Mrs M Pakes of 48 Bigginhall Crescent. Wife of Percival Clement Moody. Resided 15 Brympton Road. Killed in the Coventry Blitz 14/11/1940 Aged 39 at 15 Brympton Road. Buried Wolston Cemetery. Born 1897 Barnstaple, Devon. Son of Clement Jesse Moody and Eveline Matilda M Rutherford. Husband of Ethel Pakes. Resided 15 Brympton Road. Killed in the Coventry Blitz 14/11/1940 Aged 43 at 15 Brympton Road. Buried Wolston Cemetery. Born 09/08/1933 at Kenilworth. Daughter of Patrick Joseph Morrell and Mrs Morrell nee Taylor. Resided at 58 Three Spires Avenue. Attended Barker Butts School. Killed in the Coventry Blitz 14/11/1940 Aged 7 at 58 Three Spires Avenue. Resided at 60 Capmartin Road. Husband of M Morton. Killed in the April Raids 11/04/1941 at Daimler Limited Aged 55. Buried London Road Cemetery Coventry. Born 15/08/1901 at Cringlethwaite, Egremont Cumberland. Son of Wilkinson Mossop an Iron Ore Miner and Mary Maxwell. Brother of Tom Mossop. Husband of Mabs Mossop. Resided at 92 Arch Road, Wyken, Coventry. Employed at British Thomson-Houston Company Limited. Member of the Civil Defence Service (Fire Guard). Killed in the April Raids 08/04/1941 whilst on duty near Sewall Highway Aged 39. Buried in the communal grave at London Road Cemetery. Son of John and Mary Ann Mott of Wisbech. Resided 3 Dalton Road. Husband of Grace Emma Mott. Killed in the October Raids 21/10/1940 at 3 Dalton Road Aged 56. Buried Wisbech Cemetery. Resided 19 Lincoln Street. Killed in the August Raids 28/08/1940 Aged 25 at Swanswell Street. Buried London Road Cemetery, Coventry. Born 16/11/1913 at Ellesmere. Daughter of Frank Charles Munt, of 12 Carlton Road, Foleshill. Wife of Douglas Francis Munt and mother of baby Frank. Resided 134 Middlemarch Road, Radford, Coventry. Killed in the April Raids 10/04/1941 Aged 26 at 75 Middlemarch Road. Buried London Road Cemetery, Coventry. Born 08/11/1907 at Ryde, Isle of Wight. Husband of Frances Olivia Ann Munt. Resided at 75 Middlemarch Road. Employed by Morris Motors Limited. (Middlemarch and Grangemouth Road Fire Guard) Injured in the April Raids whilst on duty 11/04/1941 died 12/04/1941 Aged 33 at Stratford Emergency Hospital, Buried Windmill Road Cemetery. An educational book for children. Readers can discover all the foul facts about the FRIGHTFUL FIRST WORLD WAR, including what the 'Fat King' did with food scraps and dead horses, how sniffing your own pee could save your life in a gas attack and why a pair of old socks gave away top German secrets. With a bold, accessible new look, these bestselling titles are sure to be a huge hit with yet another generation of Terry Deary fans. Revised by the author to make Horrible Histories more accessible to young readers. 2018 is HORRIBLE HISTORIES twenty-fifth anniversary.